Printed for the poets' reading at the Arts and Literature Laboratory in Madison, WI. 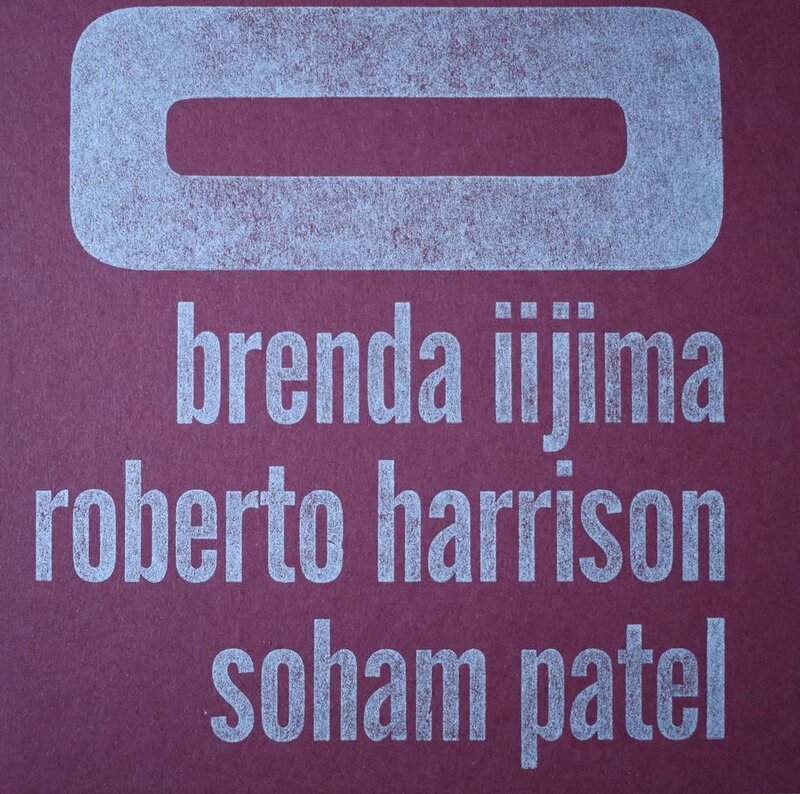 3 poems by Brenda, 3 full-color drawings by Roberto, and 3 poems by Soham. Who could ask for more? Covers letterpress printed using 30 line Teniers wood type & Alternate Gothic metal type. Check out the Rob Roy Kelly American Wood Type Collection website for a complete specimen of Teniers. Special thanks to Chris Langkamp of Sooper Dooper for giving us access to his amazing type collection! Brenda Iijima’s involvements occur at the often unnamable conjunctions and mutations of poetry, ecological inquiry, research movement, visual art, animal studies and subsumed histories. She is the author of six fulllength collections of poetry including Early Linoleum and If Not Metamorphic as well as numerous chapbooks and artist’s books. She is the editor of the eco language reader and editor of Portable Press @ Yo-Yo Labs. She has taught at The Cooper Union and Naropa University. Roberto Harrison is the author of Os (subpress, 2006), Counter Daemons (Litmus Press, 2006), Bicyle (Noemi Press, 2015), Culebra (Green Lantern, 2016), Bridge of the World (Litmus Press, 2017), and Yaviza (Atelos Press, forthcoming 2017), as well as of many chapbooks. He is also a visual artist. He lives in Milwaukee with his wife Brenda Cárdenas. Soham Patel is the author of two chapbooks from Portable Press at Yo-Yo Labs: and nevermind the storm, (2013) and New Weather Drafts (2016). She is a Kundiman fellow and a PhD candidate in Creative Writing at the University of Wisconsin in Milwaukee where she also serves as a poetry editor for cream city review.